Net proceeds from the event will support the Family Economic Security Program (FESP) at Housatonic Community College. Billie Jean King is a retired professional tennis player and founder of the Women’s Sports Foundation and the Women’s Tennis Association. Her professional tennis career spanned from 1959-1983 in which she was the winner of multiple Grand Slam Singles championships. Billie Jean King was the winner of the Australian Open in 1968 and the French Open in 1972. Billie Jean King also is a six-time Wimbledon champion for 1966, 1967, 1968, 1972, 1973 and 1975 as well as a four-time US Open champion for 1967, 1971, 1972 and 1974. Perhaps her most famous match was against Bobby Riggs in 1973 in what was called “The Battle of the Sexes” in which she defeated Riggs to a televised audience. Sports Speakers 360 is a booking agent for pro athletes. 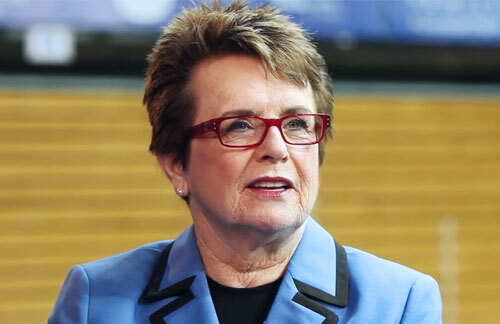 If you would like to book Billie Jean King for a speaking engagement, appearance or endorsement, contact a Billie Jean King booking agent for fees at 1.855.303.5450.